The financial establishment-banks and investment bankers, such as Citigroup, Bear Stearns, Lehman, UBS, Goldman Sachs, Merrill Lynch, and Morgan Stanley-were the cowboys, recklessly assuming risks, leveraging up to astronomical levels, and driving the economy to the brink of disaster. 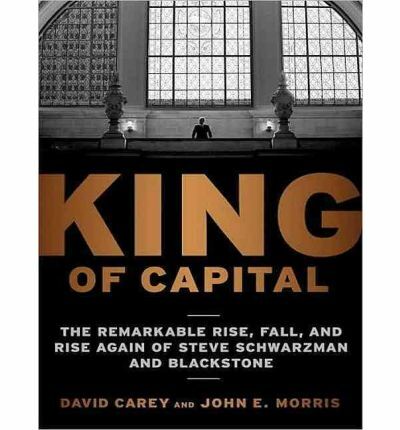 In King of Capital, David Carey and John E. Morris show how Blackstone (and other private equity firms) transformed themselves from gamblers, hostile-takeover artists, and "barbarians at the gate" into disciplined, risk-conscious investors. This is the greatest untold success story on Wall Street. Not only have Blackstone and a small coterie of competitors wrested control of corporations around the globe, but they have emerged as a major force on Wall Street, challenging the likes of Goldman Sachs and Morgan Stanley for dominance. And since it is sitting on billions of dollars that can be invested at a time when the market is starved for capital, Blackstone is now ready to break out once again. Insightful and hard-hitting, King of Capital is filled with never-before-revealed details about the workings of a heretofore secretive company that was the personal fiefdom of Steve Schwarzman and Peter Peterson. A great human interest story, as well, it tells how Blackstone went from two guys and a secretary to being one of Wall Street's most powerful institutions-far outgrowing its much older rival KKR-and how Schwarzman, with a pay packet one year of 8 million and 4 million from the Blackstone IPO, came to epitomize the spectacular new financial fortunes amassed in the 2000s. About the Author: David Carey is a senior writer for the Deal, a news service and magazine covering private equity and mergers and acquisitions. Before joining the Deal, he was the editor of Corporate Finance magazine and wrote for Adweek, Fortune, Institutional Investor, and Financial World. David has followed the buyout industry for more than fifteen years. He is a frequent guest on CNBC and is often quoted about private equity in the general business press. John E. Morris is an editor with Dow Jones Investment Banker. For many years prior to that, he was an editor and writer at the American Lawyer magazine and then an assistant managing editor at the Deal in New York and London. George K. Wilson has narrated over one hundred fiction and nonfiction audiobook titles, from Thomas L. Friedman to Thomas Pynchon, and has won several AudioFile Earphones Awards. He spent ten years in broadcast news, including for the American Forces Radio and Television Service and for rock radio in San Diego and Los Angeles. An American Academy of Dramatic Arts, West, graduate, his acting career includes stage, film, television, commercials, improvisational comedy, and stand-up. George has written and performed in over five hundred nationally syndicated short news satire features for public radio and NPR and has received a national Corporation for Public Broadcasting Gold Award for Best Public Service Program. He has also scripted and hosted corporate videos for Sony, Merck, IBM, and Price Waterhouse. He is currently working on a suspense short story collection and a thriller novel. Note: the format of this talking book is mp3-cd. This indicates it will only play on computers with CD-ROM or DVD drives or CD players that are equipped to play mp3-cds. It can additionally be cloned from a personal pc to an mp3 player like an iphone ipad sony rockbox ipod sandisk or corresponding player.